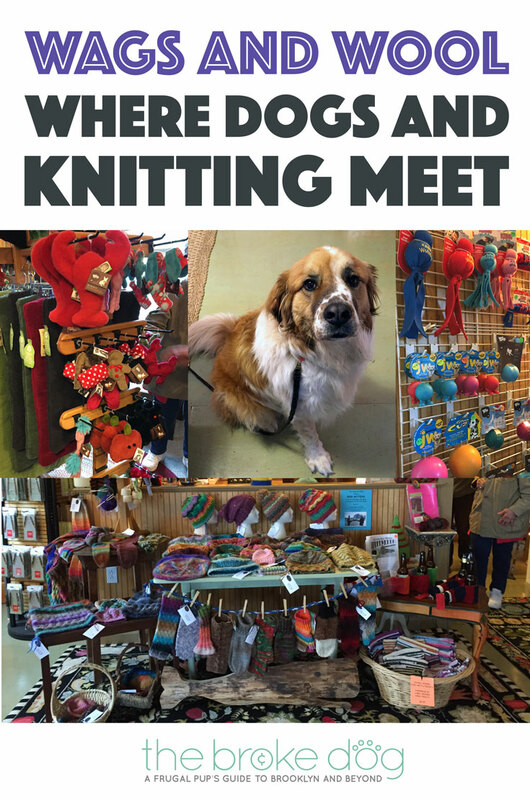 I am a knitter and actually credit this hobby for my full-time career as a cold weather accessory designer, so I just about squealed when I learned that there is a store that appealed to both my love of knitting and passion for pups. Is there any doubt that I had to stop by during my trip north? Wags and Wool from the street. There are only a few stores in Lubec, the most eastern town in the United States. 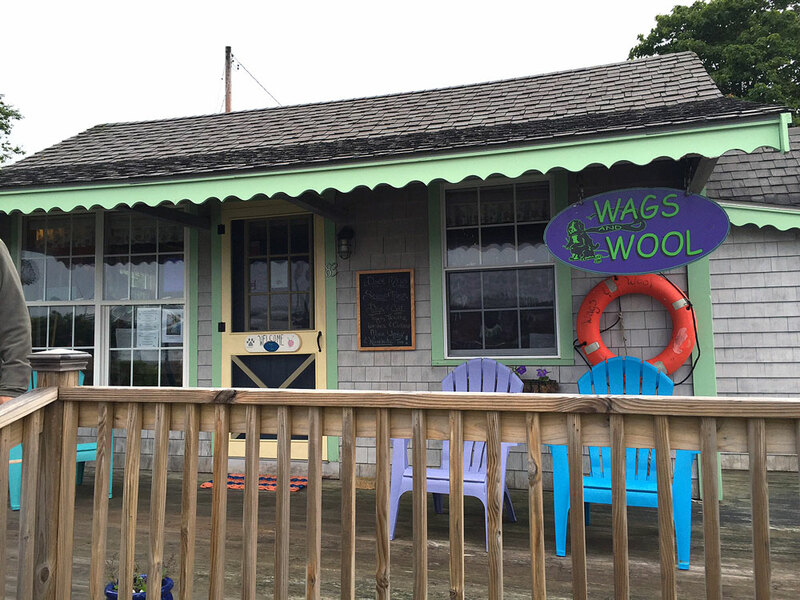 Wags and Wool (the most eastern yarn store in the United States, by the way) is mere steps from the FDR Memorial Bridge to Canada’s Campobello Island. It’s also mere steps away from the house we rented (read: DANGER! Must resist emptying bank account!). 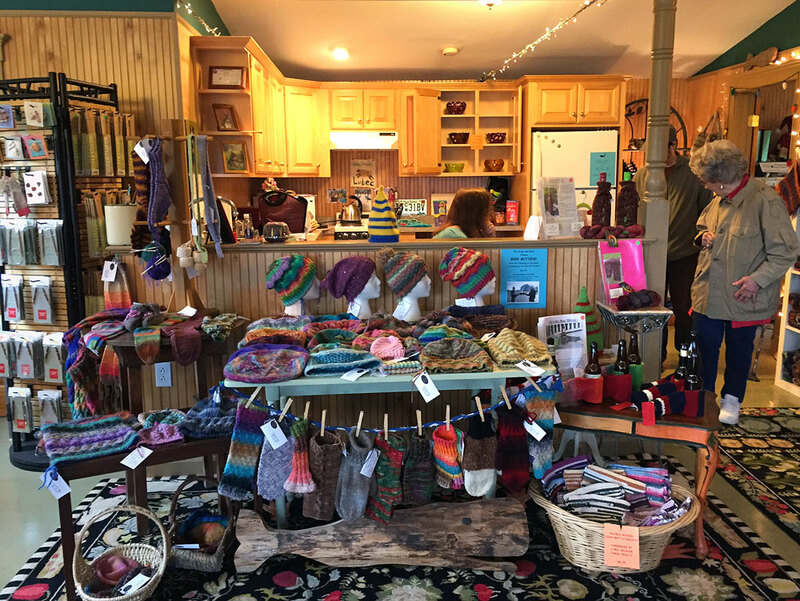 The main room, featuring notions and hand-knit items for sale. Some of the yarn available in the main room. 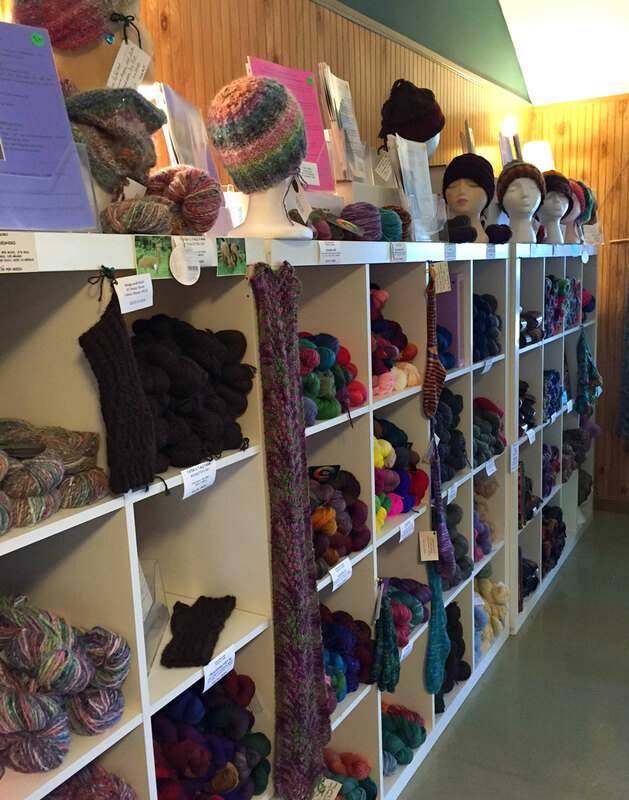 The main room features a variety of yarns, knitting needles, hand knit items, buttons and other notions. I am currently on a strict “No-Yarn” diet, so I carefully resisted browsing too much. Dog toys and beds by West Paw Design. While the main room features knitting supplies, the second room contains mostly dog items. 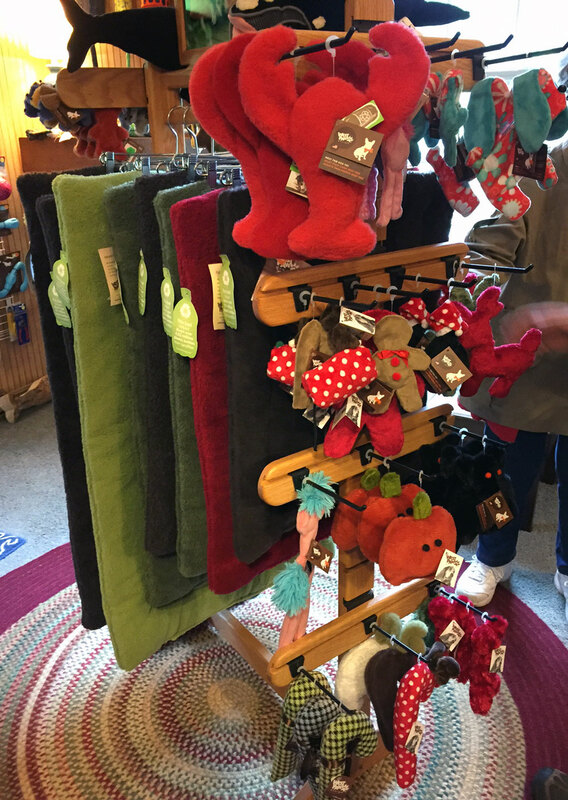 I spotted locally-made dog treats, West Paw Design beds, Lupine collars and leashes, and toys by companies like Kong and JW Pet. Although Wags and Wool is in a small town, the selection was great and the prices were reasonable. 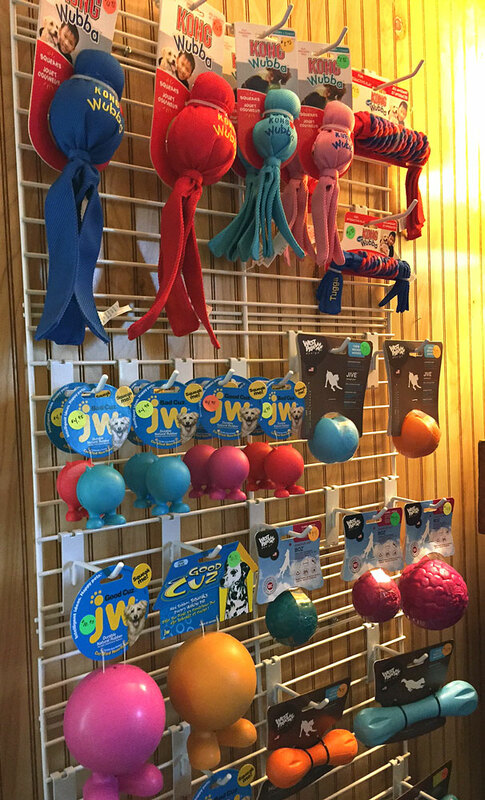 Part of the dog toy selection. Oh, I forgot something important from the main room: Tanner. 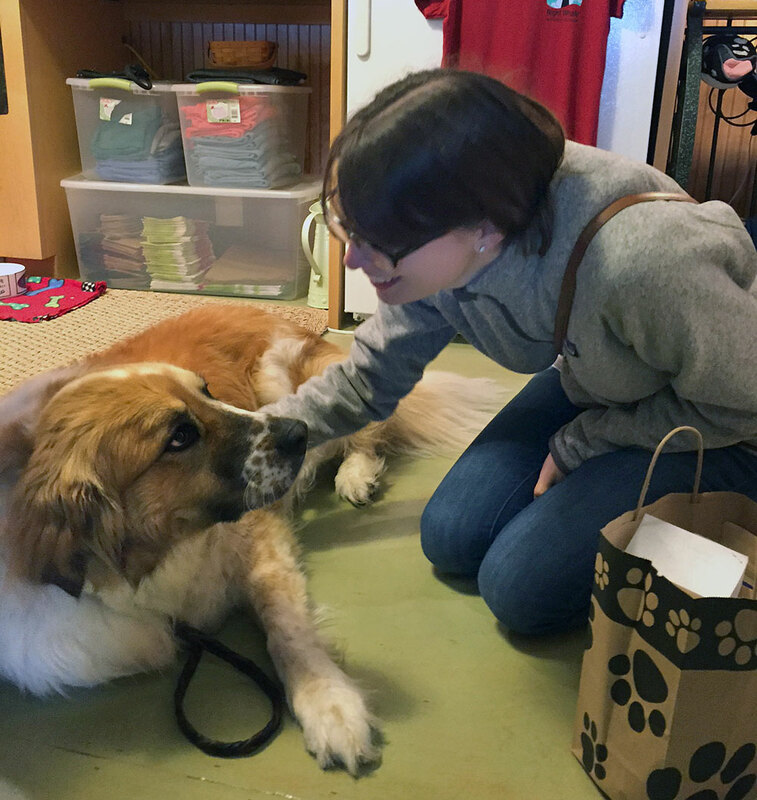 What’s a yarn/dog shop without a great shop dog? 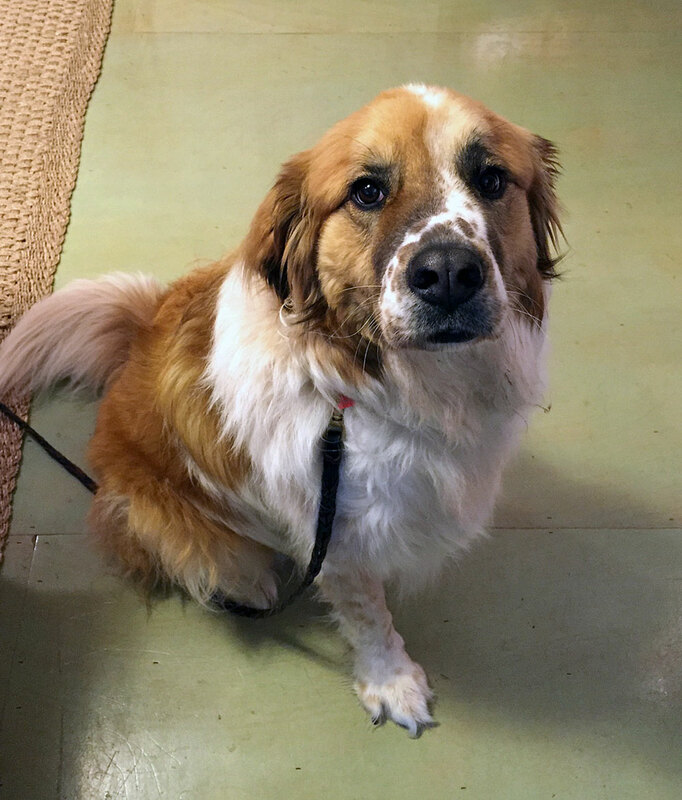 Tanner is a “four-ish” years old, 78-lb Saint Bernard/Lab mix from Big Fluffy Dog Rescue, who rescued him from an abusive home in Georgia. He clearly lives the life, soaking up pets and love from everyone who stops by. Hanging with Tanner. It was so hard to leave. He is SO FLUFFY. I spent far more time petting Tanner than shopping (YOU try to resist that face), but I did pick up some goodies for Henry and for one of you! 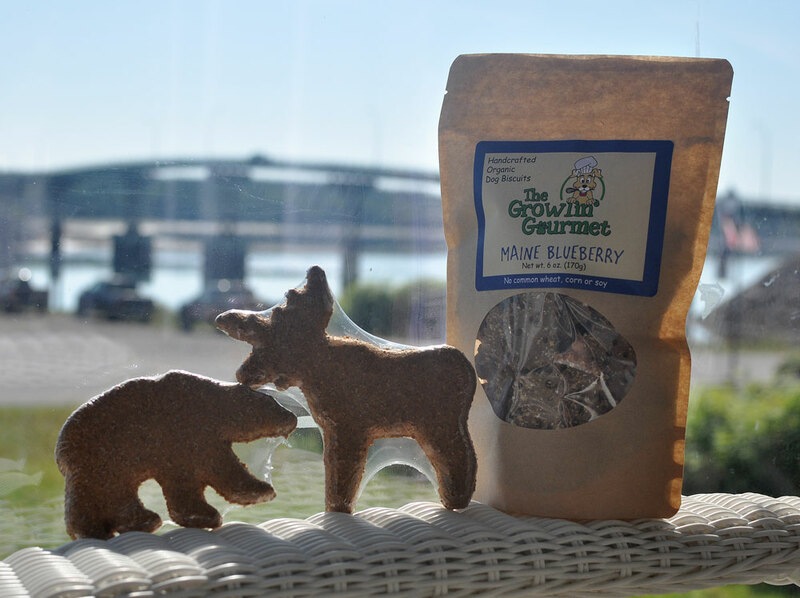 Enter Our Wags and Wool Maine Treats Giveaway! The Broke Dog purchased all three items at Wags and Wool! Enter using the Rafflecopter tool below. Must be 18+ years old and have a United States shipping address. Ends 7/26/16 at 12AM EST. I will contact the winner by email and will display the winner below. Check out Wags and Wool at their Facebook Page! I’d buy yarn (despite my own yarn diet) and dog treats! This is quite possibly the most dangerous store in all of existence. I, for one, am not into fiber art (I just cna’t get the hang of it) but I am SURROUNDED by knitters and crocheters alike who would swoon over yarn gifts. Actually, when I went to Scotland, that’s exactly what I brought them all back! Scottish wool is amazing so I got all of my yarn friends a really nice skeine. Best way to gift, IMO. 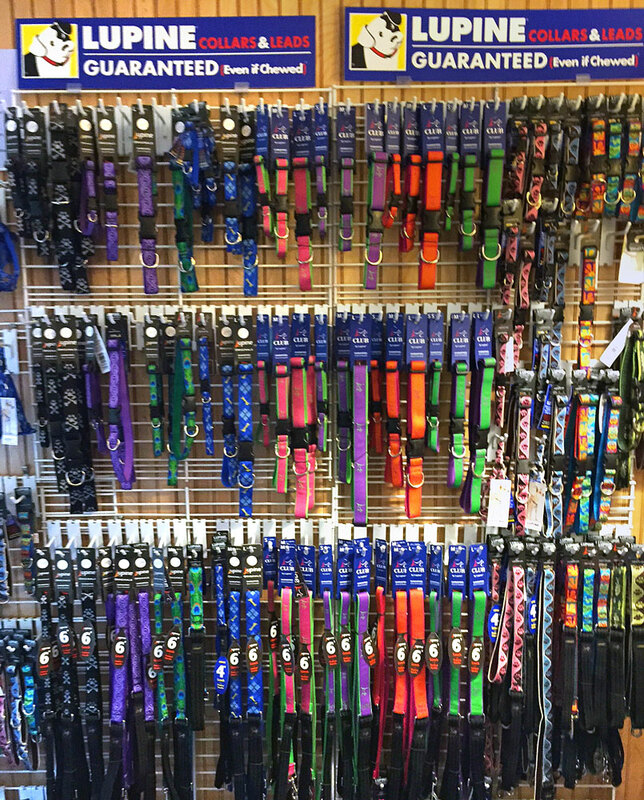 And then to be able to shop for Zoe and all my dog friends?! Ugh this place would fall into the “Take ALL my Money” category for sure. Right?! Super dangerous! And such nice people, too! I’d buy one of those big plush lobsters, three Lupine collars and a big bag full of yarn. I was SO TEMPTED by those lobsters! I ended up resisting but then buying a smaller one for Henry in a different town. They had so many nice things! I love the Pet Cube! I think I would go in here and find lots to bring home! It was very, very difficult not to take everything! What could be better than dogs and wool! Wonder do they have “dog wool” too? I hear-tell that it’s almost TOO warm to wear! I didn’t see any but I have had people ask me if they spin wool out of Tanner’s luscious fur! I actually had the pleasure of visiting this store several years ago while in Lubec. I purchased some lobster treats and other goodies for my dogs. I am certain that I would buy something similiar if I returned. That’s so great that you’ve also visited! Henry is set on blueberry treats for a while I love including him in my souvenir purchases! I can’t entr the giveaway but BOY is this a cool shop. what a wonderful ides – even a cat person like me LOVES the twhole concept! Whaaat?! Please ask them to open up a store in Belgium!! I would love it! I’m still searching for the perfect pattern to crochet Charlie a sweater! He has a bit of a tricky figure! Looks like you had lots of fun. I love visiting stores that have resident pets to greet everyone! Tanner looks so happy. I’m glad he found a great forever home! Tanner is a lucky pup! I sent the store a link to the post and they invited me back to knit with Tanner on the deck 🙂 Yes, please! Best of both words here! One day I will teach myself to knit… so I can make outfits for my dogs, obviously! Tanner can thoroughly endorse the peanut butter and blueberry treats! The cheddar ones don’t last long either around here. Yay! He’s such a cutie and was so well-behaved. Still unpacking a bit so Henry hasn’t had a chance to try the blueberry ones but I know he’ll love them too! I love the combo! A couple of the yarn stores here are dog-friendly. So cool! Two of my favorite things. I’m a terrible knitter but I love to knit super easy dog sweaters. I made a few for Bruiser years ago and they were “just ok” but it’s such a fun activity on Sundays while my entire household is watching football. Sounds like a great football alternative! I would do the same. I would love to see photos! What a fun store to visit. I could totally see myself going there and having some retail therapy. It was definitely dangerous! We had limited space in our suitcases (and limited funds int he bank, of course!) so I had to be very careful. That looks like a wonderful store! Tanner is quite the sweet and handsome dog. I am so thankful he made it to a good home. My patience disappears more with each year! I use it mostly as a stress-reducer now: it’s very calming! I don’t knit but I still think it looks like a very cool store. I would not have thought of the combo but perfect for you too. It’s a very unusual combo, isn’t it? Well isn’t Maine just the perfect place for a store like this!? I love it & Tanner is so cute, who wouldn’t want to stop by & visit him?? Hope I win the Maine treats! Thank you for entering! It was such a lovely store to visit and I could NOT tear myself away from Tanner! Good luck! there are so many things i would buy, dog treats, dog toys, beds, and a nice scarf for me. Everything was so nice! So hard to choose! I would BUY ALL THE THINGS! As a fiber artist and dog lover, I fear I may actually wind up abandoning my life in Massachusetts and living in this magical land up north! Right?! It has definitely crossed my mind! They had some great options, too! i would buy some dog treats, toys, a nice thick dog bed for my oldest and a nice scarf for me. They had a great selection! Just started including those North Woods Pet Treats in each dog bed order that ships out from my shop. 🙂 My pups LOVE them and they’re a great company! That’s so awesome! 🙂 I love that!